As my last few days of work came to an end, it was time to head to LAX and pick up my sister, her husband, and my two nieces for our week of vacation together. They arrived on an early evening flight, just as the sun was setting over the iconic Theme Building and the newer, although still modern, control tower. Our first lunch in LA was at the Southern California icon, In-N-Out Burger. The chain, which dates from 1948, introduced the idea of a drive-through hamburger restaurant. While this may seem like an incredibly pedestrian idea today (pun intended), back in the 40s, carhops served food to customers in their cars. The idea of driving through the restaurant was a perfect fit for the budding car culture that helped define Los Angeles. 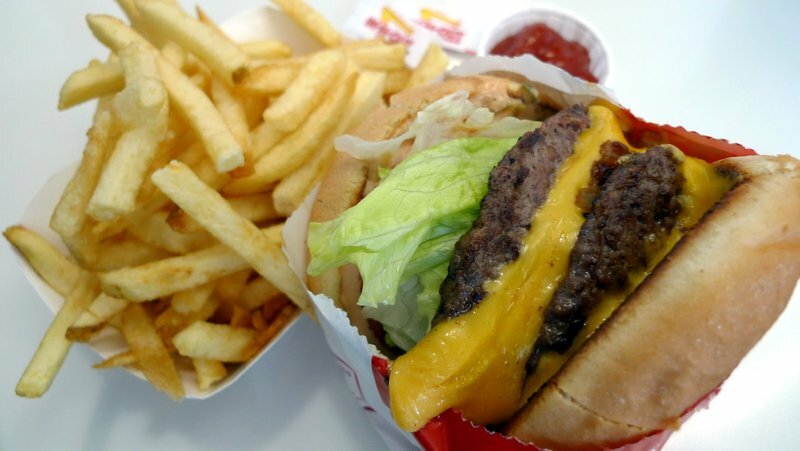 While we can debate who has the best hamburgers, something that is a matter of personal taste as much as anything else, In-N-Out provides very high quality burgers and all the ingredients are fresh, never frozen. The company makes their own hamburger patties in-house and potatoes are cut into fries throughout the day at each location. Nearly every In-N-Out has the same basic layout and cleanliness prevails. This is the only restaurant at which I’ve ever seen employees cleaning the underside of tables. The kitchen is open, so you can look on as your burger is made. It is organized chaos, a system that is impressive to watch. From what I’ve heard, employees are treated quite well. Minimum wage is $10 an hour and various benefits are offered, unusual for a fast food employer. Service is always friendly and helpful. Here’s the food itself – a Double Double (two patties, two slices of cheese) with freshly-leafed lettuce, grilled onions, and a slice of tomato. The fries are very different from fries at most restaurants. This is because they have never been frozen and aren’t pre-treated with sugar sprays or anything else like that. Just fresh potatoes, sliced by hand, then plunged into the fryer. 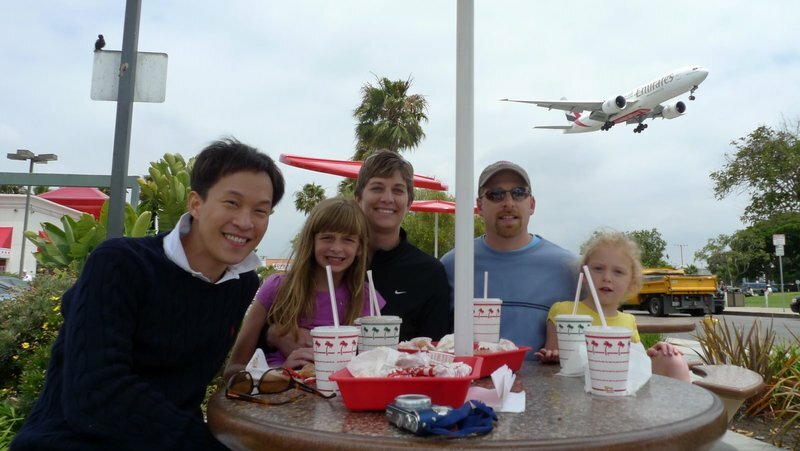 We took the girls to the In-N-Out that is located just off the end of runway 24R at LAX, the perfect place to sit, sip a shake, eat a burger, and watch the jets come roaring in on final approach. 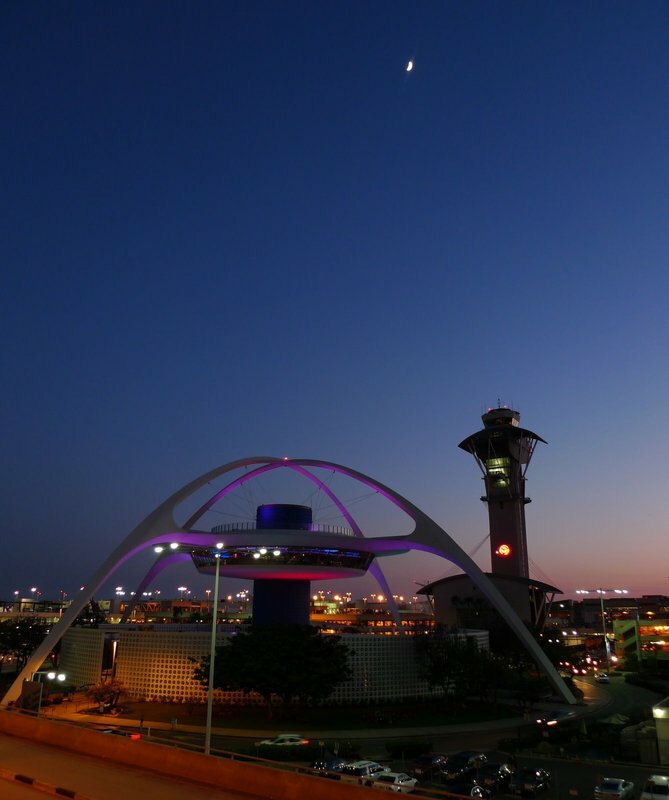 An excellent introduction to Los Angeles for first-time visitors! This entry was posted in Uncategorized and tagged Angeles, Burger, Dining, food, Hamburger, InNOut, LA, Los, Los Angeles, Restaurant by christao408. Bookmark the permalink. I love the last picture! When you have time could you put the pictures in the Dropbos? We are excited to get started on our album. Looks like good food at a fast pace exactly what the traveler needs. Wow on the inside that looks exactly like the one they just opened here. I wasn’t blown away by it (we do have Whataburger, after all :-p), but I can’t wait to go again next time I’m that far north. that last photo is awesome timing! i thought in and out was referring to it going through your system . i am not sure why. this is better. i like the idea of this place, i hope to go someday. This is new to me. From the looks of it, beats McDonalds and Burger King. I have never been to one yet. Interesting, My sister said they are out west more than here on the east coast. Thanks for sharing. i miss in-n-out! next time, you have to order off the secret menu! @Roadlesstaken – i totally agree… but then again, if there was an in-n-out here i’d be eating it way too often! 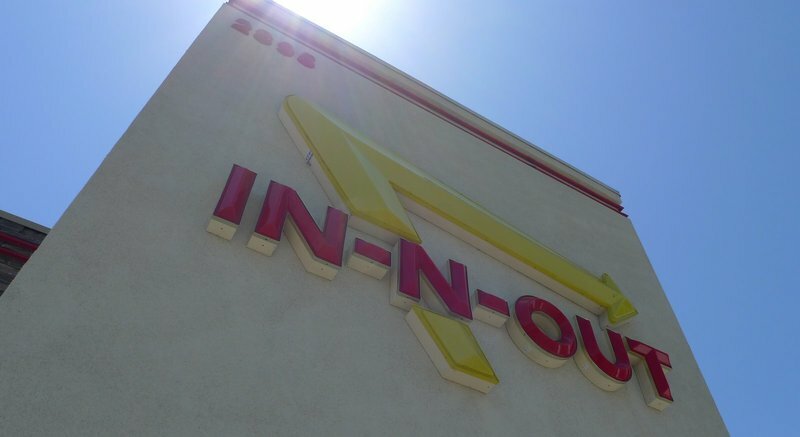 There’s an in-n-out close to home, and across the street from McDonalds — I know people who routinely buy their burgers from in-n-out and walk across the street for McD’s fries! This looks like a great way to greet the kids! It nice to meet you; i am stella duncan; i saw your profile today at (www.xanga.com) and will like to correspound with you in love and frindship; i will also like us to know each other more better, you can email me at (stelland200@live.com) . i will send you my photos as soon as i recieve your respounds. Thanks with love from Miss stella. @kunhuo42 – It’s a problem I’m willing to accept! One of my favorite styles in posts. Clear. Clean. Very informative. wow, that looks so good. I bet the girls loved it. People can always mention the In&Out v.s. Five Guy Burgers debate, but when it comes down to it, it would be very difficult to look In&Out alone(food, business style, etc) and think, “Bad.” At the very least, even if they do play simple, they do it VERY well. They don’t have long lines for nothing! Hell, In N Out opened in Dallas, Texas recently and apparently it is so good, that long lines are always there. I don’t get the logic of it even if it is a great burger. It still isn’t too good for you but having one once in awhile doesn’t hurt, I suppose. In-N-Out is always my first stop when I land in California! I love Inn&OUT! They make the BEST fast food burgers out there. Actually, In N Out never had car hops, it was always drive to the window, something new in its day. There are still some of the older stores that only have seating outdoors. And the employees also get profit sharing, which probably explains the quality of service. Unfortunately, the heir (daughter) of the founders is not very interested in running the business the way it has been traditionally run (it is a private company), and there is always a possibility that some corporation will buy it up and change everything.The last photo looks odd with the jumbo jet in the background. Now I know where I am going for lunch. that looks like a good restaurant! ten dollars an hour?! I’d work there, lol. 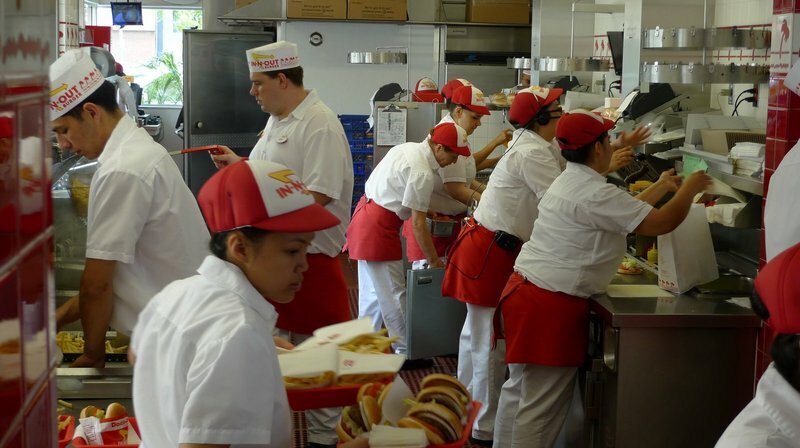 @Roadlesstaken – @Hinase – @Ikwa – My understanding is that In-N-Out keeps its geography limited to just a few states because they use a central commissary to produce the fresh hamburger patties. This ensures high quality. Not sure how they are supplying the new Dallas, TX location. As long as they stay more focused on maintaining quality than on growing quickly, they should do fine. @DrTiff – I’d agree with Schlosser, in as much as they food at In-N-Out doesn’t have any additives or other “food-like” substances. Fresh, honest food. @Ricardo98 – I wasn’t as clear as I could have been in explaining the chain’s history. In-N-Out never had car hops. Rather, car hops were the norm at restaurants at which you ate in your car. The company was the first to use a drive-through concept. @oldpartner – I’ll get all the pictures onto Dropbox in the next few days. Am finishing editing them. @yang1815 – @kunhuo42 – We did order cheese fries and I always order medium rare with grilled onions. I’m not a fan of animal style (which includes the patty cooked in mustard), though. @TheHiddenPartofMe – @drung888 – @LoBornlytesThoughtPalace – @dan – @WhenHateIsTheOnlyOption – @slmret – @The_Eyes_Of_A_Painter – There’s no shortage of people who will argue about which burger place is the best – that’s a matter of opinion, of course – but In-N-Out certainly has a very effective business model, customer service that is above average, and quality that is undisputed. I’ll let everyone make up their own mind about whether all that makes them the best burger place! @ZSA_MD – They did enjoy it and also enjoyed sitting outside watching the airplanes fly overhead. Of course, I forgot that Ava seems to have ADHD so all she needed was the distraction of having airplanes fly by… not! @Inciteful – Glad you liked it. Reminds me that I need to pay more attention to keeping my posts concise. @lcfu – Exactly! @bAbiiExxPiNay – You and thousands of others, right? =D@alextebow – I had it planned in advance and was just waiting for one of the widebodies to land. There was a Korean Air 747 that landed just as we arrived at the restaurant and then a long series of narrowbodies afterwards. @somewhatabstractelf – LOL… no, that’s not what it stands for. @awoolham – Glad you’re enjoying it as much as I am. @Fatcat723 – It is an efficient place, considering that everything is cooked to order. @bittersweetreflections – I tell you, if I were out of a job and couldn’t find anything else, I’d sure consider it! @awoolham – @Inciteful – @LoBornlytesThoughtPalace – Thanks, also, for recommending the post. I really enjoyed In-n-Out! I could definitely go for another trip there soon.